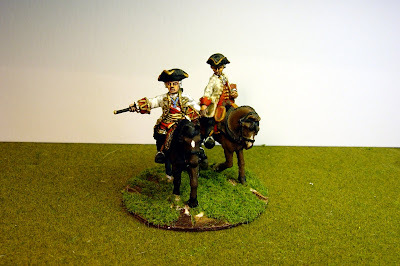 Here are some senior Generals of the Austrian SYW army in 28mm. Before I give details of who is represented I need to give a brief description of the senior ranks as they are different from the Prussian army. Major General: In the Austrian service this is called General-Feldwachtmeister (G-FWM). Lieutenant General: Feld-Marschall-Leutenant (FML) . Full General: Of infantry Feldzuegmeister (FZM) and of cavalry General der Cavallerie (GdC). So the top two pictures show Feld-Marschall Maximilian Ulysses Count von Browne with a gentleman on foot, his secretary (Foundry figure), and two (Front Rank) mounted officers. The figure of von Browne is actually a Russian General (Apraxin) from Front Rank and though the lace is slightly different the variation is not that noticeable. I like my command bases to have some sort of story to them, an interaction between the figures, and in this case my imagination tells me that the officer who has just arrived and is waving his right hand, has just interupted a discusion between Browne and his secretary about what will be served for lunch, which might account for the sour looks all around. The third picture shows a familiar friend, Feld-Marschall-Leutenant Clerici who has doffed his hat at the excellent news that has just been brought to him by one of his officers - "Sir, the Prussians are in full retreat.......". 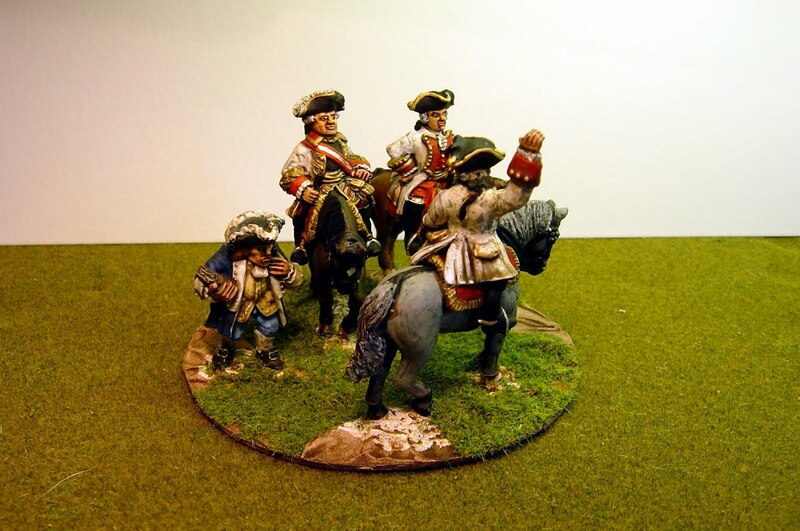 The Clerici figure is by Front Rank and the other is by Elite but on a Foundry horse. 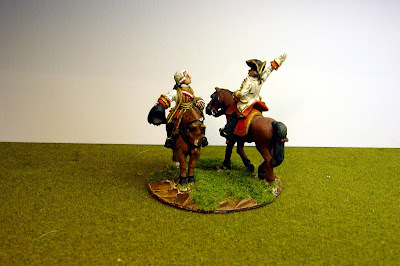 Finally, Feld-Marschall-Leutenant Margrave von Baden-Durlach is indicating to a sceptical Officer the direction he wants his division or 'Department' to deploy to. 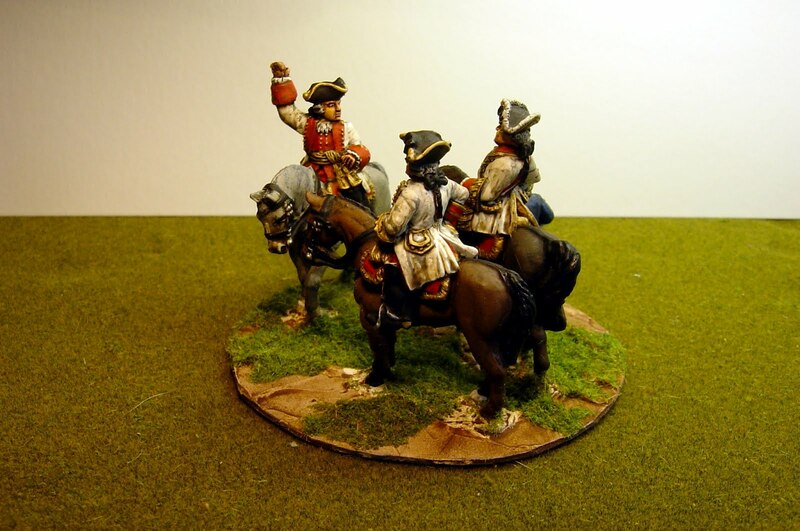 Again the Baden-Durlach figure is Front Rank and the other chap is an Elite figure on a Foundry horse. Excellent! Your generals are really great! My favourite is the Feld-Marschall-Leutenant Clerici!